According to Apple Support, users can import audio files in non-protected AIFF, WAV, AAC, Apple Lossless and MP3 into a GarageBand project. Any other files in different formats such as FLAC, CAF, APE, OGG, WMA, M4A, RA, AMR, QCP, SHN, BIK will not be able to be imported to GarageBand. Even the AIFF, WAV, AAC, Apple Lossless and MP3 should have a sample rate of 44.1 kilohertz (kHz) and a bit depth of 16 bits (files with a different sample rate might play back faster or slower). Record .caf files on iPhone (via Quickvoice app) and import them direct into Garageband (by dragging). Suddenly the .caf files are not working, opening (in any program). Converting them into MP3 with Switch, Handbrake, but they’re not recognised. Tellingly, the icon on the files has gone from being the ‘music notes’ icon (iTunes) to a quicktime icon. Recorded a very small piece of sound and try to edit it in GarageBand. GarageBand won’t allow me to add .Mp3. It says “xxxx.mp3” could not be handled because GarageBand cannot open files in the “MP3 audio” format”. To import audio to GarageBand ’11 or GarageBand for iOS, it is better to convert to AIFF, WAV, AAC, Apple Lossless or MP3 with a sample rate of 44.1 kilohertz (kHz) and a bit depth of 16 bits using QuickTime Pro or third party applications before importing them into GarageBand. This article will guide you step-by-step to convert FLAC, CAF, APE, OGG, WMA, M4A, RA, AMR, QCP, SHN, BIK, MP3, WAV, AIFF, Apple Lossless ALAC, AAC to GarageBand supported audio in AIFF, WAV, AAC, Apple Lossless or MP3 with a sample rate of 44.1 kilohertz (kHz) and a bit depth of 16 bits with professional Aiseesoft Audio Converter. Drag and drop the audio files that you want to import to GarageBand. Or click on “Add Video” button to browse your audio files and click OK to add your files. Click on “Profile” drop-down and choose desired audio formats from “General Audio” category. Take converting GarageBand FLAC to MP3 for example, choose “MP3 – MPEG Layer-3 Audio (*.mp3)” from “General Audio” category. To reserve much audio quality, you can convert your audio files to lossless AIFF or Apple Lossless. From “General Audio” category , choose “AIFF – Audio Interchange File Format (*.aiff)” as the output format. 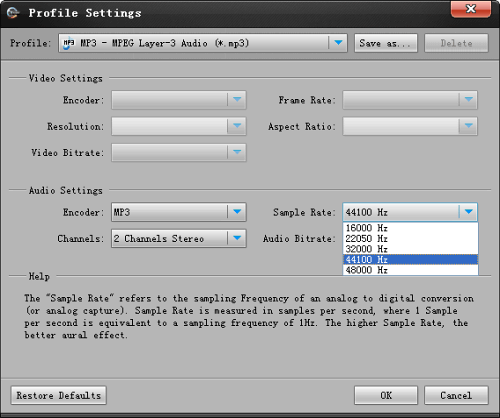 In the “Audio Settings”, click on the “Sample Rate” drop-down and choose 44100 Hz. In the “Audio Settings”, click on the “Audio Bitrate” drop-down and choose 160 kbps. Click “Open Folder” when the conversion is finished. Then drag and drop the converted files to GarageBand. 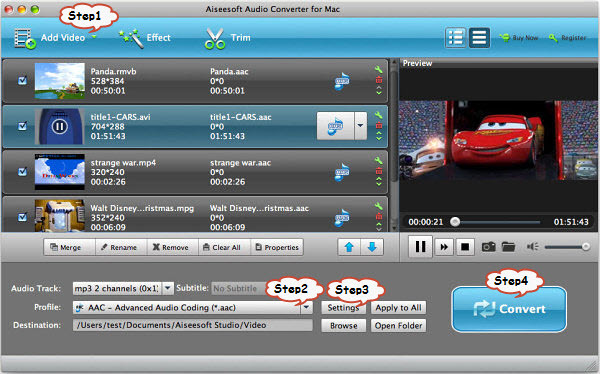 With the help of professional Aiseesoft Audio Converter for Mac (Mountain Lion, Lion, Snow Leopard, Leopard), it is so easy to convert FLAC, CAF, APE, OGG, WMA, M4A, RA, AMR, QCP, SHN, BIK, MP3, WAV, AIFF, Apple Lossless ALAC, AAC to GarageBand supported audio in AIFF, WAV, AAC, Apple Lossless or MP3 with a sample rate of 44.1 kilohertz (kHz) and a bit depth of 16 bits. Now it is such a easy thing to import desired music, songs to GarageBand for edit. The professional Audio Converter for Mac can also help you to extract audio from video AVI, MP4, MKV, MOV, WMV, MTS, WebM, YouTube FLV, etc and convert them to GarageBand supported audio in AIFF, WAV, AAC, Apple Lossless or MP3 with a sample rate of 44.1 kilohertz (kHz) and a bit depth of 16 bits. So it is also such a easy thing to import video music to GarageBand for edit. Export GarageBand to MP3, WAV, FLAC, WMA, OGG, AU, AC3, MP2, ARM How to Download YouTube videos on Windows 8 for free?